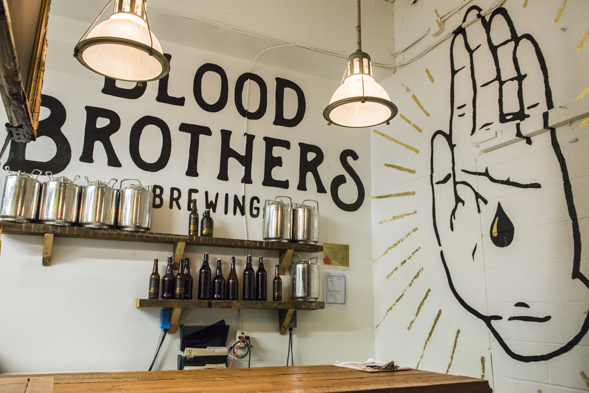 Blood Brothers Brewing recently opened their doors, and Toronto beer lovers may have found their new favourite bottle shop. 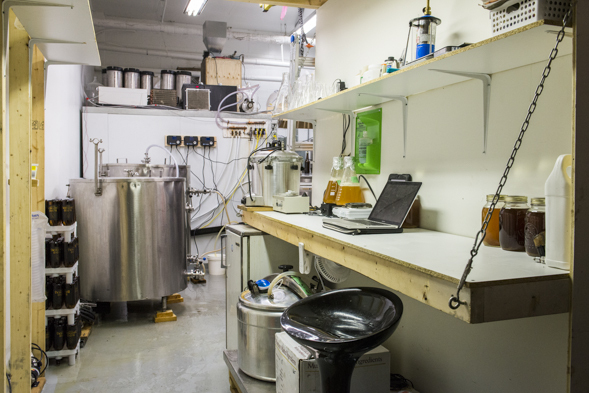 Found just off of Geary Avenue near Dupont and Dufferin, this micro brewery has confidently entered a space that is currently, very much hidden. But, is that part of the appeal? 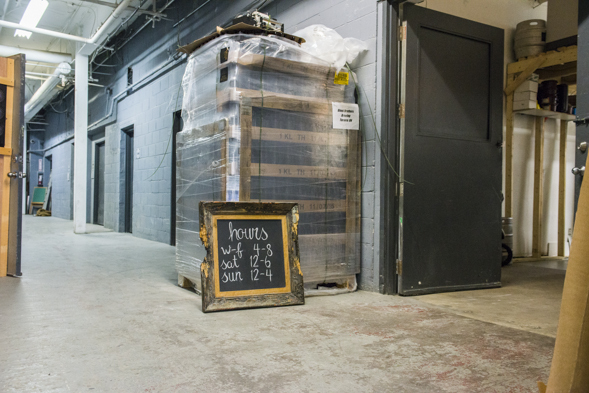 Located in an industrial warehouse, formerly home to a storage space for imported perfumes, the spot would be tricky to find if it weren't for their two strategically placed signs donning their logo and a well placed arrow - or, their instagram account, which co-owner Dustin Jones gives credit to most of their current business. When I step in the door (sharing an entrance with RE:Style Studio ), my direction is again confirmed by a small, unassuming sign spelling "beer," and pointing to another entrance - yes, that many signs are needed. When I finally find the bottle shop, it feels as though I've become part of a secret beer club, which is certainly more exciting than Toronto's latest attempts to recreate a 1920's speakeasy. Onto the good stuff: beer. 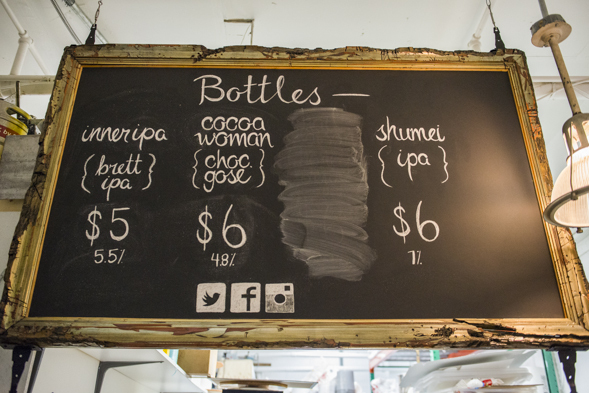 Their 500 mL bottles sell for $5 - $6, with a rotating selection based on the season. Kegs are also available, with varying prices depending on the flavour. While I'm there, they have Inner IPA, Cocoa Woman, Hail Saison and Shumei on offer. The beer is brewed in house, and you can see the fermenters in action at the back. 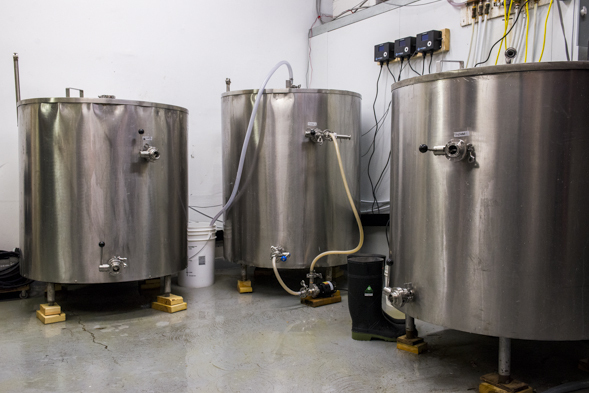 Their largest fermenter, retrofitted from old dairy equipment, leaves them with roughly 1064 bottles, and the batch gets split up between bottles for the shop and kegs for their licenses. 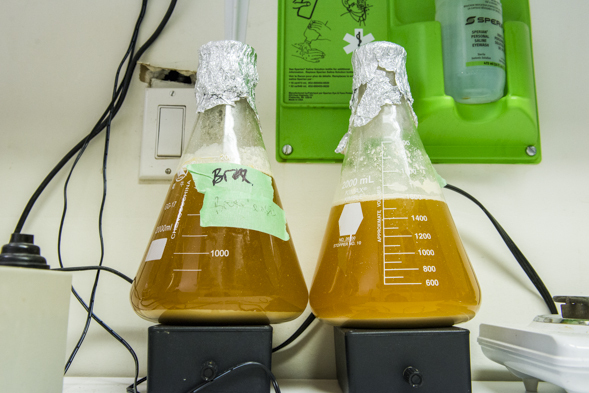 On average, they can turnaround beer in ten days, but Dustin mentions each style can vary on how long it takes to condition, and it's all about tasting the beer to see when it's right. 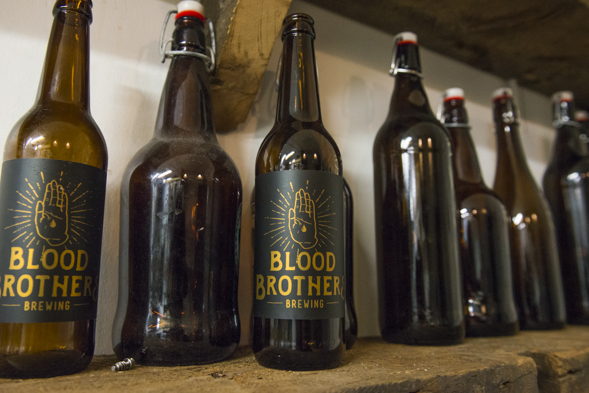 All the bottles are branded with the same unique Blood Brothers label, differentiating the flavours with a simple tag attached to the neck with a rubber band, including the name and percentage. The blood brothers, Dustin and Brayden Jones, with their wives Courtney and Jaime, started the brewery simply out of their love of beer. "We started as beer fans, based our vacations around beer, so we started making beer," Courtney and Dustin tell me. I ask them about the flavour rotation and Dustin says they try to mix it up every few months. "We'll probably have the Inner IPA and the Shumei year round, and have between 2-3 on seasonally." With a growing number of accounts across Toronto, you can also find their beer at a variety of craft friendly spots, from High Park to St. Lawrence Market. Fortunately for me I score one of the last Hail Saison's ($6) until next year's batch, and the fruitier complexion is incredible. I also try the Inner IPA ($5), their best seller, which has a unique, hoppy flavour without being too overpowering. The unpretentiousness of the space adds to the appeal, harnessing the owner's true passion for beer. From the counter made of reclaimed wood and old doors, to the simple brown paper bags used to carry the product, it's clear their focus is on quality of beer rather than overpriced packaging and accessible storefront. 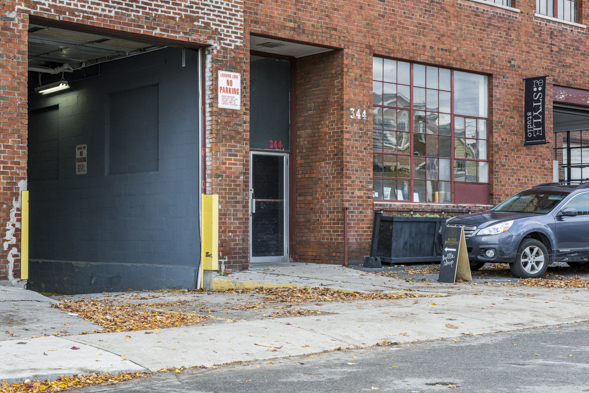 So, how do they get customers into their unassuming warehouse? Their unique flavours and evolving product. Courtney confidently states "people who love beer in the city will come out for it." Dustin adds in, "For us, we want to bring beer to market. We want to keep it interesting. If we were just making a pale ale or a lager, why would anyone want to come out to Geary Avenue?" Blood Brothers is cash only so plan ahead.